What information belongs in a Business Plan? A business plan is a living document that maps out the details of your business. It covers what your business will sell, how it will be structured, what the market looks like, how you plan to sell your product or service, what funding you’ll need, what your financial projections are, and which permits, leases, and other documentation will be required. At its core, a business plan helps you prove to yourself and others whether or not your business idea is worth pursuing. It’s the best way to take a step back, look at your idea holistically, and solve for issues years down the road before you start getting into the weeds. This post covers tips for writing a business plan, followed by an outline of what to include and business plan examples. Let’s start with some basic, overarching tips before we dive in to the details. Grab your free business plan template here and apply the practices below. Before you start whipping up a business plan, think carefully about what makes your business unique first. If you’re planning to start a new athletic clothing business, for example, then you’ll need to differentiate yourself from the numerous other athletic clothing brands out there. Remember: You’re not just selling your product or service — you’re selling a combination of product, value, and brand experience. Think through these big questions and outline them before you dive in to the nitty-gritty of your business plan research. Business plans are more short and concise nowadays than they used to be. While it might be tempting to include all the results of your market research, flesh out every single product you plan to sell, and outline exactly what your website will look like, that’s actually not helpful in the format of a business plan. Know these details and keep them elsewhere, but exclude everything but the meat and potatoes from the business plan itself. Otherwise, you might risk losing your readers’ attention. Your business plan shouldn’t just be a quick(ish) read — it should be easy to skim, too. That’s where formatting becomes particularly important. Use headers and bullet points, bold or highlight the key lines or metrics you want the reader to take away, and even attach labeled tabs to your copies (paper and digital) for easy reference. Keep in mind that your business plan is a living, breathing document. That means you can update your business plan as things change. For example, you might want to update it a year or two down the road if you’re about to apply for a new round of funding. Overview: Briefly explain what the company is, where you’ll be located, what you’ll sell, and who you’ll sell to. Company Profile: Briefly explain the business structure, who owns it and whatprior experience/skills they’ll bring to the table, and who the first hires might be. Products or Services: Briefly explain what you’ll sell. Next, you’ll have your company description. Here’s where you have the chance to give a summary of what your company does, your mission statement, business structure and business owner details, location details, the marketplace needs that your business is trying to meet, and how your products or services actually meet those needs. NALB Creative Center is a start up, to go into business in the summer of this year. We will offer a large variety of art and craft supplies, focusing on those items that are currently unavailable on this island. The Internet will continue to be a competitor, as artists use websites to buy familiar products. We will stock products that artists don’t necessarily have experience with. We will maintain our price comparisons to include those available on line. We will build an Artist’s Oasis tour program. We will book local Bed and Breakfasts; provide maps and guides for appropriate plein-air sites; rent easels and materials; sell paint and other supplies and ship completed work to the clients when dry. One of the first questions to ask yourself when you’re testing your business idea is whether it has a place in the market. The market will ultimately dictate how successful your business will be. What’s your target market, and why would they be interested in buying from you? Get specific here. For example, if you’re selling bedding, you can’t just include everyone who sleeps in a bed in your target market. You need to target a smaller group of customers first, like teenagers from middle-income families. From there, you might answer questions like: How many teenagers from middle-income families are currently in your country? What bedding do they typically need? Is the market growing or stagnant? Include both an analysis of research that others have done, as well as primary research that you’ve collected yourself — whether by customer surveys, interviews, or other methods. This is also where you’ll include a competitive analysis. In our example, we’d be answering the question: how many other bedding companies already have a share of the market, and who are they? Outline the strengths and weaknesses of your potential competitors, as well as strategies that will give you a competitive advantage. Green Investments has identified two distinct groups of target customers. These two groups of customers are distinguished by their household wealth. They have been grouped as customers with $1 million in household wealth. The main characteristic that makes both of these groups so attractive is their desire to make a difference in the world by making investment decisions that take into account environmental factors. Green Investments has segmented the target market into two distinct groups. The groups can be differentiated by their difference in household wealth, households of $1 million. Here’s where you can go into detail about what you’re selling and how it benefits your customers. If you aren’t able to articulate how you’ll help your customers, then your business idea may not be a good one. Start by describing the problem you’re solving. Then, go into how you plan to solve it and where your product or service fits into the mix. Finally, talk about the competitive landscape: What other companies are providing solutions to this particular problem, and what sets your solution apart from theirs? Use this section to outline your business’ unique organization and management structure (keeping in mind that you may change it later). Who will be responsible for what? How will tasks and responsibilities be assigned to each person or each team? Includes brief bios of each team member and highlight any relevant experience and education to help make the case for why they’re the right person for the job. If you haven’t hired people for the planned roles yet, that’s OK — just make sure you identify those gaps and explain what the people in those roles will be responsible for. The labor force for DIY Wash N’ Fix will be small. It will consist of a part-time general manager to handle inter-business relationships and corporate responsibilities. In addition, DIY Wash N’ Fix will employ three certified mechanics/managers; their duties will consist of the day-to-day operation of the firm. These duties fall into two categories: managerial and operational. Managerial tasks include: scheduling, inventory control and basic bookkeeping. Safety, regulatory issues, customer service and repair advice are the operational tasks they will be responsible for. Additionally, customer service clerks will be hired to perform the most basic tasks: customer service and custodial. DIY Wash N’ Fix will have a single general manager to coordinate all outside business activities and partnerships. The business relationships would include accounting services, legal counsel, vendors and suppliers, maintenance providers, banking services, advertising and marketing services, and investment services. Laurie Snyder will fill this general management position. She will be receiving an MBA from the University of Notre Dame in May 2001. The daily management of the business will be left to the lead mechanic. Even though DIY Wash N’ Fix is not a full service repair shop it can be expected that some customers will attempt repairs they are not familiar with and need advice. Therefore, we intend to hire three fully certified mechanics. The mechanics will not be authorized to perform any work on a customer’s car, but they will be able to take a look at the car to evaluate the problem. To reduce our liability for repairs done incorrectly we feel only professional mechanics should give advice to customers. The primary function of the mechanics will be customer service and managerial responsibilities. On the marketing side, you’ll want to cover answers to questions like: How do you plan to penetrate the market? How will you grow your business? Which channels will you focus on for distribution? How will you communicate with your customers? On the sales side, you’ll need to cover answers to questions like: what’s your sales strategy? What will your sales team look like, and how do you plan to grow it over time? How many sales calls will you need to make to make a sale? What’s the average price per sale? Speaking of average price per sale, here’s where you can go into your pricing strategy. For more help with your marketing and sales strategies, go to our online guide for how to start a business and scroll to the “Marketing, Sales & Services Tips for Startups” section. The Skate Zone plans to be the first amateur inline hockey facility in Miami, Florida. Due to the overwhelming growth of inline hockey throughout the United States, the company’s promotional plans are open to various media and a range of marketing communications. The following is a list of those available presently. Print advertising and article publishing. The company’s print advertising program includes advertisements in The Yellow Pages, Miami Express News, The Skate Zone Mailing, school flyers, and inline hockey trade magazines. Internet. The Skate Zone currently has a website and has received several inquiries from it. Plans are underway to upgrade it to a more professional and effective site. In the future, this is expected to be one of the company’s primary marketing channels. Finally, outline your financial model in detail, including your start-up cost, financial projections, and a funding request if you’re pitching to investors. 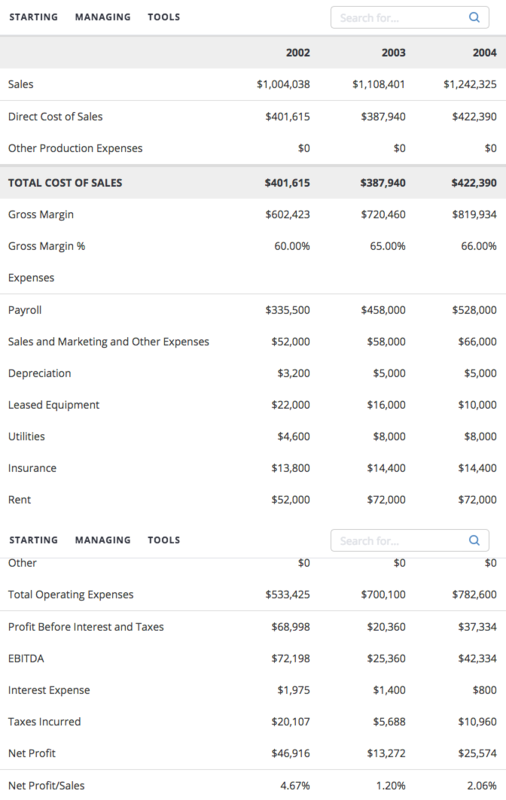 Your start-up cost refers to the resources you’ll need to get your business started — and an estimate of how much each of those resources will cost. Are you leasing an office space? Do you need a computer? A phone? List out these needs and how much they’ll cost, and be honest and conservative in your estimates. The last thing you want to do is run out of money. Once you’ve outlined your costs, you’ll need to justify them by detailing your financial projections. This is especially important if you’re looking for funding for your business. Make sure your financial model is 100% accurate for the best chance of convincing investors and loan sources to support your business. Lack of funding can lead to unique challenges for business owners with disabilities, check out this article for a fully accessible guide to starting a business with a disability. The following table is the projected Profit and Loss statement for Markam. Finally, consider closing out your business plan with an appendix. The appendix is optional, but it’s a helpful place to include your resume and the resume(s) of your co-founder(s), as well as any permits, leases, and other legal information you want to include. There you have it. We hope this has helped you get a better idea of what a business plan should look like. Now it’s time to turn that business idea into a reality. Good luck!